Radified Community Forums - To clone or to Image, what is the difference. Radified Community Forums › Rad Community Technical Discussion Boards (Computer Hardware + PC Software) › Cloning Programs (Except Norton Ghost) › To clone or to Image, what is the difference. My OS (Win 7 pro 64) is on a ssd and is almost full. I would like clone it to a larger ssd. What would be the best cloning software to do this? I already have backup software that's now quite dated and has been discontinued that says it can copy my drive, but not sure if it can work with two ssd drives. Re: To clone or to Image, what is the difference. Should be easy to do. Which software do you have? First, can you post a screenshot of Disk Management as that will guide what we do next? My software is Ghost 15, I'm not sure if it's OK say anything about Ghost on this forum, I'm sorry if it is. I haven't purchased a new ssd yet, but I planned to get a Samsung 512 GB 850 pro. which will replace my Samsung 256 GB 840 pro which only has about 20 GB of space left. I will try to get you a screenshot tonight. this is a task I made with my production system when I switched from a Samsung 840 EVO 120 GB to an 850 EVO 250 GB. It's easily operated by using the Data Migration tool from Samsung. The important point is that it's highly recommended to connect the new SSD to the same SATA port used by the old one. The best is obtained by using a special SATA-USB cable. Please, read and attentively follow the user guide of the tool and you'll see that the switch is really easy!!! Anyway, in this case a real cloning is operated; after the cloning, you can image the system at your will. Here's the screenshot you asked for. Sorry about my screenshot, after resizing it to fit the 200k limit there isn't much left. Your screenshot shows the OS on Disk 3 and there is only one partition on Disk 3. Is that correct? Can you make a Ghost 15 image of that partition? Where will the image be written? Internal HD? Yes the OS (C drive) is on disk 3. I don't have a external enclosure for a ssd but I could buy one as it might be easier to do it that way. I do have a Ghost image of my C: drive for use as a backup. But wouldn't the copy my drive be a true clone of the OS? Could you give a short outline as to the difference between Copy my drive vs Backup image? There are two methods to upgrade to a larger drive. "Copy my Drive" and Image/Restore. The latter is more reliable and is my preference. 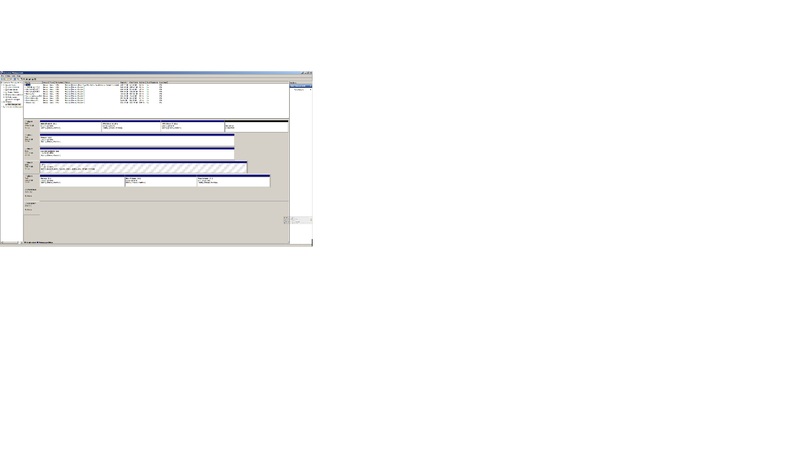 You would create a Ghost 15 image of your Win7 partition, writing the image to a partition on one of your internal HDs. An image is just a file so you can write it to any partition. Then remove the old SSD and replace it with the new SSD. The old SSD isn't in the computer for the restore process. Then boot the Ghost 15 CD into the Ghost recovery environment and restore the image to unallocated Free Space on the new SSD. I'll describe the options along the way. You don't need an external enclosure for this method. No USB HD is needed either but I note you have one. If your Win7 image isn't recent, create a new one as you want the image to be current. I mentioned "old SSD isn't in the computer for the restore". One of the issues with Copy my Drive is drive letter anomalies but this doesn't occur with Image/Restore. 2 - With Data Migration tool, and the new SSD attached through SATA-USB cable to your system, make a "clone" of your existing ssd, following the recommendations of the tool Data Migration; a "clone", as also the terms says, is a "quasi-replica" (byte-to-byte) of your old ssd (physical copy), hence including also the "wasted" space. 5 - Once the new system has benn cleaned and stable, at your will make an image, which is a non-physical "copy"
Has the new SSD arrived yet? I just ordered it today from New Egg, I had a hard time finding it in stock, most places had it 2 to 4 weeks out. I will post a reply to this forum when I get the ssd, and I'm ready to proceed with the image. All I need to do is swap out the old drive with the new. I assume that the new drive out of the box is unallocated space? Yes, the SSD will have unallocated free space without a partition. Good. Remove the old SSD and install the new SSD. Same cables. Same SATA port. Boot the Ghost 15 CD. If you are asked to Initialize the new SSD, Accept.